Before, I was using ‘the old way’ (see below), but I’ve since found out that, while my script below works for very ‘vanilla’ installs of WordPress, if you have any plugins that store or serialized data, and the string length changes, it very well could break some stuff, so use that with caution. There’s a “Dry Run” option – this will let you see what will be changed before you commit to the change – I typically run this just to make sure I didn’t do something silly before. Click “Run” and wait for it to finish. No, really – go back and DELETE THE SEARCH AND REPLACE TOOL! I looked all over for a simple MySQL Script that I could run to update all occurrences of my dev URI to my live site to no avail. So I took it upon myself to figure it out myself… and I’m a nice guy, so I thought I’d share. 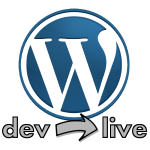 Modify the “wp-config.php” file in the root with the new database credentials and save. Assuming I did everything right, bask in the glory of my newly launched site. It really is just that easy… yeah, I know. Easy is relative. But if you’re developing a website, you should know how to do (or at least how to find) all of the steps above. This will only update the values in the default WordPress tables. If you have plugins installed that also reference the domain, you’ll need to verify and update those fields manually (or find the tables / columns that reference the site address [URL]).